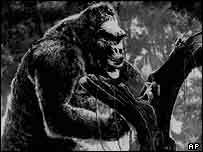 Giant ape King Kong, who ran amok through Manhattan, has been voted the most terrifying movie monster of all time by film experts. The hairy monster hit cinemas in black and white in 1933 but has managed to remain the most fearful of celluloid creations despite colourful rivals. UK film magazine Empire put the more recent T-Rex from Jurassic Park fourth in their top ten monster list. The 100-foot bronze Talos from Jason and the Argonauts came second. In the 1963 film the metal giant chases the Argonauts and smashes their ship the Argo. Calling him "the boss", Empire said: "Other pretenders try to dethrone him, but the lord of Skull Island tramples them all. He's a terrifying force of destruction, yet beautifully human." The poll comes right up to the present day with in sixth position the spider queen Shelob, who entangled actor Elijah Wood in last year's Lord of the Rings: Return of the King. Peter Jackson, the film's Oscar winning director and the man behind the Lord of the Rings trilogy, is remaking King Kong on a £70 million budget in his native New Zealand. The film should be ready for release in 2005. The story revolves around a film producer who goes on Safari and returns to New York with a giant ape. 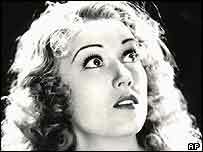 Falling for a beautiful woman, King Kong makes his last stand on top of the Empire State Building with the film's star Fay Wray clutched in his hands. On its release its makers RKO Radio Pictures described it as the thrill of thrills and the American Film Institute ranked it as among the 50 best films of the 20th century. The Alien which erupts from John Hurt's chest during the 1979 Ridley Scott Alien film, came third. Of the ten monsters, seven have been in films in the last 25 years. In fifth position is The Thing, from the 1982 John Carpenter film of the same name, who is described by Empire as the "extraordinary organism that trashes all sense of bodily integrity". But the award to the scariest beast of them all went to the Skinned Werewolf from the 1984 British film The Company of Wolves. Empire called him, unlike his ape rival, "hairy on the inside, the travelling man who bloodily tears his own face away in rage at a faithless bride". Those who failed to make it into the magazine's top ten include the Japanese titan Godzilla, who is 50 this year, the robot endoskeleton who appears at the end of the first Terminator film, and the flying monkeys from The Wizard of Oz.